I have a confession. As far as I know there’s no shame in it, though it’s not something a lot of people understand. I didn’t visit Scotland until later in life, but even before then, I knew it. I suspect it’s genetic. The rolling green fields of Eastern Nebraska and Western Iowa of my childhood begged to be dotted with fluffy white sheep and Highland cattle and criss-crossed with walking paths. Reading brain-science books describing the “perfect” human geography conjured images for me of tidy green midlands rather than African Savannah. My nephew, who attended college in Stirling, Scotland, would probably beg to differ about the country’s appeal. For him, a poor student in a city with town-gown conflicts, Scotland was all NEDs, drunks, and police harassment. But as a tourist seeking countryside and quaintness, I found what I was looking for. Even the stinking-drunk Scotsman who approached us in Stirling at 2:00 (in the afternoon) and started rambling at us about the virtues of William Wallace seemed more colorful than menacing. We’re fortunate to be going back for a two-week stay in Edinburgh later this year. So in the spirit of anticipation, I’d like to offer my absolute favorite Scottish films. Here they are. When I first saw Local Hero I was just old enough to see it by myself, having read a favorable review. I liked it just fine, but it didn’t make a huge impression on me until I saw it a second time on video. By the time Gordon Urquhart starts jumping on his bed with excitement at how rich they’re going to be, I was jumping in my seat over how delicious the irony was. For those who don’t know: the film is about a man named MacIntyre (his Hungarian-immigrant parents thought it sounded American). 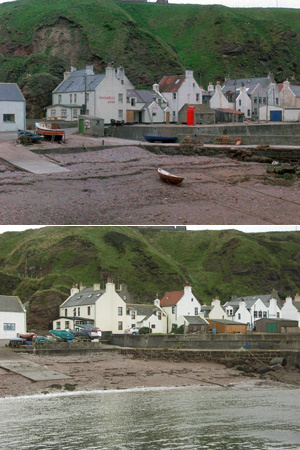 The oil company where he works sends him to a little coastal town in Scotland to buy up all the property so that it can be demolished to make an oil terminal. The quaint and curious townsfolk are all too eager to sell, but over the course of the film, “Mac” comes to love the place and the community that he’s been sent to destroy. I first saw this film when it was revived by Martin Scorsese. I’ve seen it twice since then, and it’s another charmer that has insidiously worked its way into my brain. Wendy Hiller plays Joan Webster, who proudly sings “I know where I’m going!” as she packs for her wedding to the wealthy man who owns a Scottish island. She feels she’s destined to marry wealth, and the time has finally come. She gets as far as the next island over, but Fate keeps throwing up storms that prevent her crossing the water to her new husband. While she waits out the weather she comes to love the little village, its history, and the humble-seeming Scotsman who lives there. The filmmaking team of Michael Powell and Emerich Pressburger made British propaganda films during World War II. These were not rabble-rousing, jingoistic action films, but rather stiff-upper-lip portraits of the best of Britain. They showed their British audiences the noble, humble character of the kingdom — and the people — that they were fighting to defend. More self-consciously quirky than some of my more beloved films, Whisky Galore (a.k.a. Tight Little Island) is nevertheless a worthy entry on this list. Based on a true story, the film tells of the residents of a remote Scottish island enduring the privations of World War II. The worst of the shortages is whisky, which is becoming more and more expensive — assuming it can even still be bought. A ship wrecks in the harbor and naturally the townsfolk investigate. It turns out the ship was carrying... you guessed it. The comic conflict centers around the moral quandaries of whether it’s okay to “salvage” a wee nip, and if so, how much. 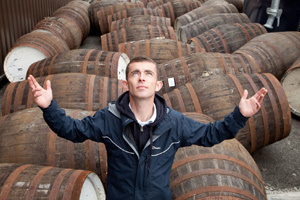 Speaking of whisky, Ken Loach interrupts the proceedings of The Angels’ Share to take us on a tour of a Scottish distillery. The guide tells us that even that little dent in the copper piping will affect the flavor of the whisky produced at the facility we visit. The tour isn’t completely gratuitous. The film is essentially a heist movie. But instead of stealing cash or diamonds, the target of the thieves is a recently discovered centuries-old whisky. Ken Loach usually makes bleak films about the poor and disenfranchised in the U.K. (notice I didn’t include Sweet Sixteen on my list — not because it’s a bad film, but because it’s hard to call it a “favorite.”) Once in a while he makes something a bit more lighthearted, as he has done here. 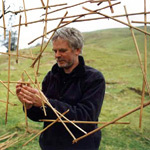 Not all of Goldsworthy’s works featured in this film are made in Scotland. He builds a winding stone wall in the U.S. He builds a stick dome that washes out to sea, and an ice sculpture that melts by noon somewhere in North America. But I’d love to be hiking around his home town and stumble upon a hollow filled with yellow flowers, or a pile of reeds lined up to polarize the afternoon sun. On my first visit, I was fortunate enough to see a Goldsworthy stone “pine cone” at the botanic gardens in Edinburgh. Most of the Scottish films I love are set in small villages or the countryside. But The Illusionist is set squarely in Edinburgh. It’s an animated film, but I easily recognized the castle, the bus depot, and the general character of the streets. I’m also a huge fan of the French comic filmmaker Jacques Tati, so The Illusionist is a double treat. Director Sylvian Chomet (The Triplets of Belleville) found an unproduced screenplay of Jacques Tati’s and decided to make the film as an animated feature. Some say it’s just as well Tati never made The Illusionist as the script couldn’t have worked as a live-action film (it features a young girl living with an unrelated older man). As a cartoon, and set in a simpler time, the story of two misfits finding companionship in each other works quite well. Jonathan Glazer directs Scarlett Johansson in this disturbing and mysterious film. It’s set in Scotland, but it doesn’t necessarily make you want to visit. Still, It’s an excellent movie that deserves repeated viewings. Johansson plays a sort of black-widow stalker of Glaswegian men. She drives around in her van and when she spots a single man, she offers him a ride. Though some passengers seem to leer, others are simply being helpful or flattered — offering directions to Johansson or accepting a ride from a pretty young woman. Instead of taking them where they want to go, she takes them back to her lair made of light, glass, and cinema. There, she does what a black widow does, though we only get disturbing hints of what actually happens. A mid-movie segment sees Johansson lose her van to Scottish fog. She has to maneuver on foot and on public transport in a very practical but ugly pink wool sweater. She’s now at the mercy of the gruff but ultimately helpful Scots; the tables have turned. Lars Von Trier was getting press as the co-founder of the “Dogme 95” movement in film. Breaking the Waves, from 1996, was one of the first examples of this new minimalist style. Being a film snob, I took a very long time to warm up to the melodrama (because it was shot on video). Emily Watson’s Bess was so naïve and so superstitious that I found her difficult to relate to. Her deep love of her husband, an oil rig work off the coast of Scotland was only outdone by her childish needs. The power of Von Trier is his relentlessness. By the emotionally painful end, I was bawling with the rest of my audience. I still remember the last scene: A long take of an unexpected rainbow; Elton John; and a sense of humanist acceptance in the face of tragedy. I might have included Trainspotting on my list of favorites, but it’s been so long since I’ve seen it that I couldn’t write anything intelligent. I think I preferred the book, which is written in a phonetic Scottish accent that takes a whole chapter to gel in your head. I’d also like to have included That Sinking Feeling, a blue-collar good-time gang movie set in Glasgow and directed by Bill Forsyth (Local Hero). But since its VHS release decades ago it hasn’t been available in the U.S., and I haven’t seen it yet. My English film-critic friend Amber who lives in Edinburgh thinks The Wicker Man should be on every list of Scottish films. The Wicker Man is to Scotland what Deliverance is to the American South. Probably neither should be included on a well-meaning list of regional cinema. By all means leave a comment with your favorites. I’d love to discover some more Scottish gems before my next visit.